Completed the Macallan Fine Oak range, got another Royal Wedding bottle of Littlemill and ordered more samples than I can reasonably drink. Now that I have achieved my goal of having one bottle of every distillery of Scotland, I am after tasting one dram at least of every distillery of Scotland. 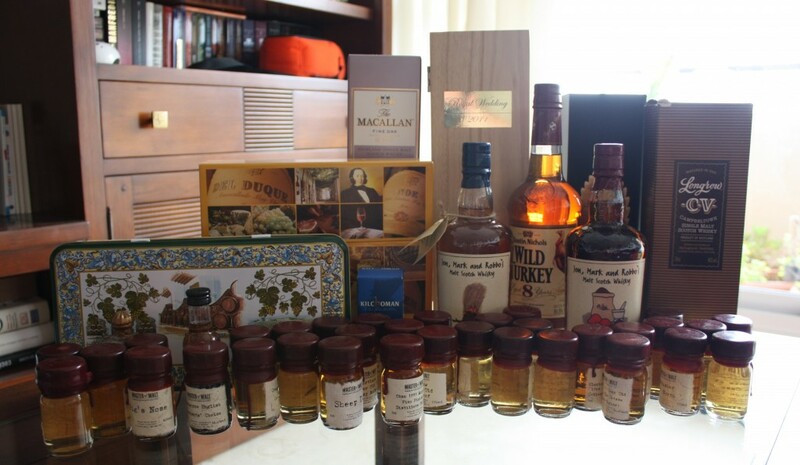 Thanks to Master of Malt the goal is cheaper :), I can’t imagine where to store so much full size bottles. I have also ordered a set of glasses from The Whisky Exchange, the tulip glass of Single Malts of Scotland. They look really cool and the crystal is really fine. As an extra goal, I have completed my collection of The Macallan Fine Oak range with a 17 year old Fine Oak that is for North America. Also I have added the bottles I bought at Gonzalez Byass Tio Pepe Bodega when I visited it. Soon I will publish the tasting notes from its full range of products. Too bad that being an independent reviewer is so expensive. Anyway, enough wording. Here you have the bottles.